Family and friends say they’re in shock over the death of a woman in an explosion at a Southern California office building. The victim hasn’t been formally identified but authorities said they believe it’s Ildiko Krajnyak (IL-di-koh KRY-nyak), a cosmetologist who owned the day spa where the blast occurred Tuesday. Irene White, a family friend, read a statement Wednesday on behalf of Krajnyak’s family. White asked for privacy as they mourn her. She said the family is cooperating with investigators. White also solicited donations to an online fundraising campaign to bring Krajnyak’s son home from college and help pay for a funeral. The explosion damaged a two-story building in the city of Aliso Viejo and injured three other people, including two who remain hospitalized. Authorities say they believe a woman killed in an explosion at a Southern California office building ran a day spa there. Orange County Undersheriff Don Barnes says the formal identification of the body is continuing Wednesday but authorities believe it is that of Ildiko Krajnyak (IL-di-koh KRY-nyak), a licensed cosmetologist. The explosion Tuesday badly damaged a two-story building in the city of Aliso Viejo and injured three other people, including two who remain hospitalized. Krajnyak lived in the Orange County community of Coto de Caza. A neighbor who would only identify herself as Tiffany told The Associated Press that Krajnyak lived with her husband and her mother and has a son at Washington State University. The neighbor says Krajnyak and her husband were separated but still living in the same house. The neighbor says Krajnyak was her mother’s caretaker and describes the husband as a massage therapist and nice man. Associated Press writer Amanda Lee Myers. Authorities say a deadly explosion at a Southern California office building is being investigated as a crime and the woman killed is believed to be the owner of the business. Officials with the Orange County Sheriff’s Department and the FBI released details of the investigation at a news conference Wednesday. FBI official Paul Delacourt says investigators do not believe the Tuesday afternoon blast in the city of Aliso Viejo was an accident, and items that were possibly part of an explosive device have been sent to an FBI lab. The officials say there have been no arrests. Officials say other potential causes such as a gas leak have been ruled out. Two injured people are expected to survive after surgery and a third was treated at the scene for smoke inhalation and released. 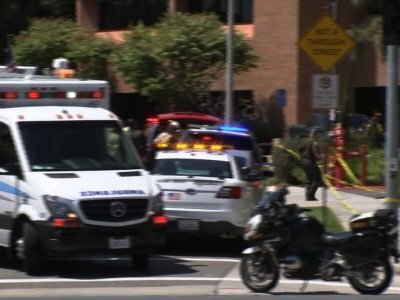 Two officials have told The Associated Press that an office in a Southern California medical building was targeted by an explosive package. The officials were briefed on the investigation but not authorized to discuss the matter publicly and spoke to The Associated Press Wednesday on condition of anonymity. One woman was killed and three other people were injured in Tuesday afternoon’s explosion in Aliso Viejo. One of the officials said one of them was believed to be the target. The officials said the explosion did not appear to be part of a broader plot and there was no immediate connection to any extremist groups. Orange County sheriff’s officials said late Tuesday night that they had not found a specific explosive device and were continuing to sift through the debris left from the explosion. Officials are investigating an explosion that killed a woman and injured three other people at a Southern California medical office building. Orange County Sheriff’s Department spokeswoman Carrie Braun says investigators worked through the night and were still at the scene Wednesday morning. A U.S. official told The Associated Press that the explosion is believed to have been intentional and may have come from a package. The official was briefed on the investigation, was not authorized to discuss the matter publicly and spoke to The Associated Press on condition of anonymity. A sheriff’s official said late Tuesday that no specific device had been found. Investigators are searching for clues about an explosion at a Southern California medical office that left a woman dead and three other people injured. The Tuesday afternoon blast occurred in Aliso Viejo, which is about 50 miles south of Los Angeles. It blew siding off the walls, exposing insulation and framing and shattering windows at the two-story building. A federal official told The Associated Press late Tuesday that the explosion is believed to have been intentional and may have come from a package. Authorities say the dead woman had been inside the building. Witness Mary McWilliams tells the Orange County Register that she saw two burned women stagger from the building. Fire officials say a third victim had smoke inhalation. There’s no word yet on a motive for the explosion. — Associated Press Writer Michael Balsamo.